A Timeless Elegant Vintage Art Deco CIRCA 1920s Diamond Engagement Ring with GIA Certified 5.05ct Asscher cut Center Diamond in L color VS1 clarity (Warm White color and Very Clean). 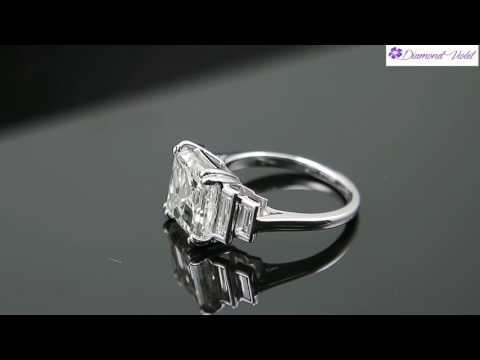 Perfectly shaped Asscher cut's measurements are 9.62x9.36x6.33mm. It is set into Gorgeous Unique Mounting Platinum (stamped) and accented with 4 Large Straight Baguette Diamonds, totaling to estimated 0.76ct in H-I color VS clarity over all. Finger size is 6, can be re-sized. We offer FREE sizing with purchase. The band tappers from 2.04mm to 1.73mm, sits medium off the finger: 6.34mm high. The weight is 6.8 grams, Solid.